We first met Kim Watson Brooks in the spring of 2000, during production for Chickspeare's Henry IV, which was directed by Joanna Gerdy and performed at the now defunct Johnson Beer. In Henry IV, Kim played Westmoreland, Gadshill, and Lady Percy. Her Lady Percy revealed a depth that predicted her success as an actor. Kim is currently appearing as Vennie in Charlotte Rep's Jar the Floor, along with Venida Evans, Suzzanne Douglas, Gretha Boston, and Elizabeth Wells Berkes. We met in 2000, during Henry IV. That was the Chickspeare production. I played Lady Percy, and was also Gadshill and Westmoreland. Lady Percy was my favorite character of the three I played. I like Shakespeare’s women. They tend to be women with persuasive ways to get what they need or want. Shakespeare’s women are very powerful. To be Hotspur’s wife, Lady Percy had to be strong. She wielded power in a very feminine way, meaning to play against what is usually seen as being powerful. That’s always fun. Let’s talk about your early career. Did you do this in college? I started in college, at UNC. I started taking performance classes, and then that expanded to doing shows. For one particular show I did, Annotation of a Funky Breakdown by Paul Beatty, I was awarded a Chancellor’s Award and a monetary award. It was very cool to do something I loved and get that kind of recognition. What did you think you wanted to do you your life before getting involved in theatre? I didn’t know. But I thought, if I can communicate well, I’d figure it out. Sales was my background, because when I went to college, I was a part of a program called Inroads. Inroads is an organization that helps minorities get into corporate America. So, if you have a certain grade point average in high school, and you’re doing well, they bring you in and you take tests. In the summers you take classes in business etiquette, English, math, things like that. I did that through high school. Did you meet your husband in Chapel Hill? I did meet Aquate in Chapel Hill. He’s from Chapel Hill and was home from school the weekend that we met. We hit it off right away and have been together ever since. He was going to school at St. Augustine in Raleigh. We met, started talking, and he told me he was going to call me the next day. You know how that works. Well, he did call me the next day. The fact that he did what he said he was going to do, the fact that he wasn’t interested in coming up to my room, but interested in getting to know me... I appreciated that. The thing that I appreciate the very most about my husband is his honesty. I think of it as an almost child-like honesty, because even if you don’t like it, he wants to let you know what he really thinks. He’s my very best friend. What had you done in Charlotte before Henry IV? I did a piece in Rock Hill. A Midsummer Night’s Dream. Chris O’Neal and lots of people from Winthrop University were involved. I played Hippolyta, and we performed in the park with an 80’s theme. I was onstage for maybe five minutes, but had a wonderful time doing it. Did you study Shakespeare in college? I’d studied it but never performed it. I thought that the language was so beautiful. The fact that it transcends time makes it even better. A lot of the issues are the same things that are still the big themes today: lust, greed, betrayal. And to able to say "what’s up?" by saying "what ho?" is very, very cool. What made you decide to audition for the Chickspeare play? Did someone bring you in? No, I looked it up in Creative Loafing. I decided to audition for the Chickspeare piece because I missed the stage. I missed getting a script, diving into it; not only learning the lines but learning the individual. I had no idea what this would be like, but thought, why not? At the time, I was at Infinity Broadcasting doing media sales. That was my sponsoring company while in the Inroads program. Just before finishing high school, Inroads set up interviews to see which of the sponsoring companies wanted to hire each of us for a paid internship. Once you have a sponsor, you work for them during the summers, holidays, whenever you come home. It’s really advanced, because they treat you exactly like you’re a regular employee. After college, I worked for my sponsoring company. I did sales for some of the events that the stations were producing. My focus was the urban stations, WPEG, WBAV, and WGIV. WBAV had the highly acclaimed Tom Joyner Show. That was a wonderful opportunity. Who were the people that first gave you encouragement to choose the acting path? The person I first talked to about possibly doing it was Mark Sutton. He was very encouraging. I met him in an eight-week class taught by Steve Umberger and Rebecca Koon. We had a scene together. He was so truthful in his performances, and that helped me. He was working at Children’s Theatre, and my first professional gig was Ice Cream Man. Mark directed that, and cast me as Sharon. His insights helped me to make my character better. Ice Cream Man was the show that allowed me to say, "I could do this. I don’t have to do something I don’t really love. If I’m going to be practical, I can be practical in gearing myself toward what I really want to do." A lot of nine-to-five things can’t compare with the work I put in, not only learning lines but also researching my character, and researching the other characters to find out what they say about my character. Mark was a really positive influence. I had another friend who was very supportive about life, in living life to the fullest and doing what we feel we’ve been put on this earth to do. Most importantly, my husband has always been supportive. He trusts my decisions. Whatever I’ve ever been adamant about doing, I’ve worked it so I can do it. He knows this about me, so I don’t think he was ever worried. He knows I’m a hard worker. Let’s compare you with Vennie, your character in Jar the Floor, in just this one aspect. How is her journey different from yours? Vennie is still caught up in what her mother thinks. She tries to pretend that she’s hard, and that she doesn’t care, but she wants her mother’s approval. Another difference is that her mother is supporting her financially. I’ve always thought that any kind of financial support comes with strings attached. I’ve never wanted anyone to think that they were taking care of me so that they could tell me what to do. Vennie still has those strings. Another thing is that I don’t know if Vennie really wants what she says she wants. I know that the kind of investment I put in can make it happen, but I haven’t seen that with Vennie. I’d like to see what happens to Vennie later, to see if she’s paying her way, but in the play she hasn’t made the sacrifices you need to make when you really want to pursue something. Vennie could be very talented, but until you step out and make things happen for yourself, there’s no way to determine where you’ll go. So you don’t know whether Vennie makes it as a singer. No, I think I’m dealing with Vennie the way that she deals with herself: day-by-day. I don’t think that Vennie is goal oriented. She deals with what comes her way, but doesn’t think very far out. In your interview with JoAnn Grose, you said that you bring Vennie home in a way that you may not bring other characters because you shaved your head and changed your own appearance in a way that you can’t put back every time you leave the theatre. Do you think you bring Vennie home just for that reason, or is there something about Vennie that makes you want to bring her home? There’s something about all my characters that I relate to. You have to in order to connect. I find out things about myself. In dealing with Vennie, I deal with myself and my relationship with my mother. I love my mother so much, but we tend to be victims sometimes. Things should have been different, or you should have said this or done that. To have to face the fact that I had a part in everything that’s past is something I’ve learned from Vennie. I am engrossed in the role. I don’t know if that’s so healthy, but it’s much more difficult to let a character go when you are stuck, physically, in that position. I have a bald head. 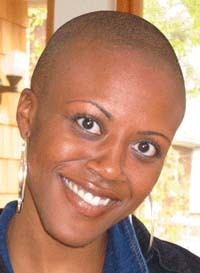 Kim Brooks would probably never wear a bald head out in public, but when I go out people aren’t reacting to Kim Brooks. They’re reacting to my character Vennie, because Vennie’s the one with the bald head. To have those dealings offstage helps me onstage, and I can’t help but take that home. This play is very much about the human condition, and it seems a play like this would stay with you more than one that’s clearly separate from your own life. My godmother, Mother Brown, passed away almost a year ago. I say that this is her gift, her way of speaking to me, because she always wanted me to understand my mom’s position. Now, I’m more able to see that whatever your parents do or don’t do for you, they’re still doing their best. I see the generational evolution, and that has been the most rewarding thing. I have another level of appreciation for my mother. What did your mother say about your bald head? Wow, it’s weird. Where was this mom when I was a teenager? She said she thinks it’s beautiful. What else would you like to say about your husband Aquate? I have to say that Kim would not be Kim without Aquate. The blessing that god has given us is more than I can articulate. He’s my best friend, and I trust him. He has great character. The head of our home, which my husband is, is phenomenal. Have the other ladies in the cast met him? It’s funny, because they’ve told me that my husband gets the "sexiest husband" award. I say, "I know that, but it’s not even his best part." It’s his light. No matter where we go, he has this magnetic energy that people are drawn to. I’m blessed to have that in my life. Doesn’t he do something in the entertainment business? Yes. He has a regular job as a loan officer, but recently started doing entertainment wrestling. He’s "The Wolf." Oh my goodness, it’s fantastic. He likes playing a bad guy, and people love to hate him. Let’s do a rundown of some of your favorite roles. I love roles for different reasons. I loved playing the python in Jungalbook, because I loved the reaction it got from kids. We were dealing with human/animal hybrids, and I’m a big kid. Whenever I get to do something fun like that, it’s a joy. I enjoyed Negras Eros, which was also directed by April Jones, because I could see myself onstage in twenty plus roles. That challenged my versatility. Jar the Floor is just great. It has everything. It’s got a cast that I enjoy spending time with and working with, and just watching. I’ve learned more about the craft. It takes your game up to another level. I’ve really enjoyed everything I’ve done. I appreciate any time I’ve worked with Alan Poindexter. His vision is so beautiful, and I love to see it come alive on the stage. Next, I’m going to Lexington, Kentucky to work on a project for the children’s theatre there. It starts in January and ends sometime in March. This is an opportunity to find out what being away from home for an extended period is like. After that, there are things in the works that I’m trying to make some decisions on. Hopefully, no down time. I don’t like down time. Thanks for taking the time to talk with us, Kim.